In the burgeoning publishing category of hardcover comics memoirs, Houghton Mifflin makes a strong entrance with Alison Bechdel's Fun Home. 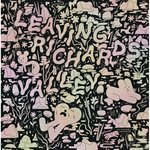 This work is as forcefully felt a memoir as any yet published in comics, but, more than this, it has a strong claim to being the single most culturally sophisticated work yet produced in this genre. The deeply cleansing catharsis that it achieves is enabled by Bechdel's extensive use of literary reference. She draws on a full complement of her artistic forebears to create an elaborate intertextual support narrative in a manner that is akin to that which her father employed in his painstaking restoration of the gothic revival mansion which is the central setting for the story. Life as it is portrayed in Fun Home is never far from a literary antecedent and always at home in the text. Proust and Joyce provide the two main support posts of her narrative, while their Parisian contemporaries -- among them Colette, Fitzgerald and Hemingway -- are visible throughout, and a host of others from Homer through Kate Millet, including, most notably, Oscar Wilde, provide a wide variety of decorative flourishes -- both interior and exterior. While Fun Home is the most culturally grounded of any comics memoir yet published, this isn't to imply in any way shape or form that this is a dry or overly bookish work. Not at all. It is vibrantly alive. Alison and her parents are vividly rendered in both language and line. The narrative pacing, the flow of the images across each page, the delineation of the facial expressions, body language and fashion sense of the characters, the recreation of the ambience of her childhood home -- all are impeccable. Fun Home tells a tale that is by turns heartwarming and heartbreaking, that ranges in its telling from piercingly insightful to willfully unseeing. It relates the clash between her parents' cosmopolitan sensibilities and the small town reality that becomes the setting for their physical existence; of their inevitable flight into the pleasures and consolations of the text, and, at least in her father's case, of the flesh as well. The fact of her father being, in addition to his full time job of high school English teacher, the third generation of his family to head the small town's funeral home -- the "fun home" of the title -- is almost too fitting. The entire book is rife with such parallels, coincidences and synchronicities. The structure of Bechdel's narrative interweaves the biography of her father -- as well as, although to a far lesser extent, that of her mother -- with her own autobiography. Their stories intersect and cross back and forth in time and space, creating a crazy quilt of a story that one senses exactly captures the way these experiences are organized in her memory, providing a singularly honest self portrait. It is the question of sexual identity (or, gender identity and sexual preference, if you prefer) that is the gradually revealed center of the relationship between father and daughter, and the book as well. This question leads the reader inevitably to the classic quandary of the heritability of homosexuality. Bechdel clearly presents us with a picture where both genetic predisposition and home environment play a role, but where one begins and the other ends is left entirely open, allowing the reader the rare opportunity to confront this question in an intelligent, neutral setting where her or his preconceptions can be clearly and calmly examined. It is no mean feat to accomplish this. This debate leads to the ultimate -- and essentially Christian -- question of the primacy of spiritual versus corporeal* paternity, with the shared spirituality on display here being comprised primarily of self-motivated interaction with the great works produced by the aforementioned pantheon of literary and artistic forbears. 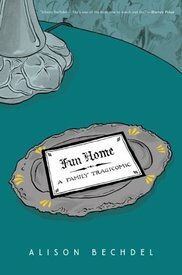 All in all, Fun Home is a wholly absorbing portrait of the artist as a young woman that provides its readers with an engaging experience liberally seasoned throughout with original and unique insights into the human condition, but that leaves us with one tantalizing question: "Alison, why comics?" There is a gaping elision in this tale as to how and why it came to be told in comics. Based on the evidence given, one would assume that it should have taken the standard written form, as aside from the standard cursory -- and entirely normative -- portrayals of her drawing as a child and a single example of her doodling on a page of Joyce's Ulysses (an admittedly choice metaphor) the only reference to comics in the entire work is the seemingly derogatory example of one of her father's army bunkmates reading an issue of Haunt of Fear while her father occupied himself with the weightier-by-contrast fare of a biography of F. Scott Fitzgerald. So, Ms. Bechdel, should you ever decide to return to this work in the future for any revisions, please consider this request that you provide a prologue and/or epilogue that discusses your discovery that you were a comics artist. Or, better yet, save this for the sequel.